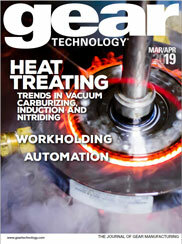 The complete Industry News section from the January/February 2013 issue of Gear Technology. If you make hardened gears and have not seen any micropitting, then you haven’t looked closely enough. Micropitting is one of the modes of failure that has more recently become of concern to gear designers and manufacturers. Micropitting in itself is not necessarily a problem, but it can lead to noise and sometimes other more serious forms of failure. Predicting when this will occur is the challenge facing designers.